Deck your vehicle out with Parts & Accessories to suit your needs. Whether you are looking to take your LandCruiser cross-country, your Hilux up the beach or put roof racks on your Corolla our Parts and Accessories specialists are here to assist you every step of the way. Our Parts Interpreters are continually trained to Toyota standards enabling us to be able to advise you on the part or accessory that best suits your needs. Are you looking for an access point to purchase Genuine Toyota Parts and Accessories? Well look no further! At Sunshine Toyota we take Parts and Accessories very seriously. 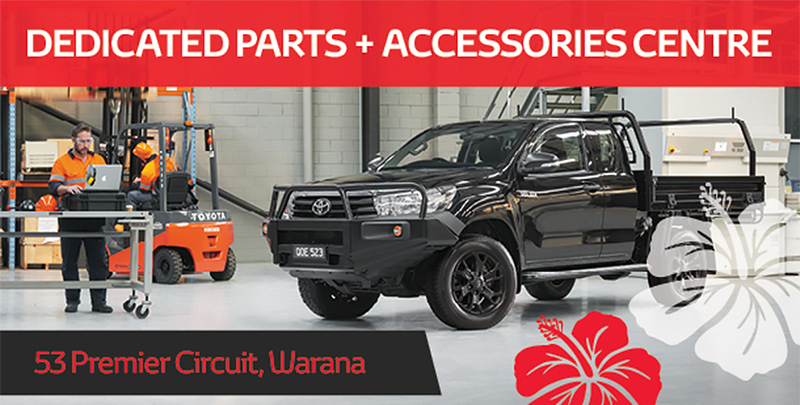 So much so that we have a dedicated Parts and Accessories Centre located at 53 Premier Circuit, Warana on the Sunshine Coast. Q: Can we supply same-day parts? Order before 10am and we will have your part to you same day. Did you know that we are the only dealer on the Sunshine Coast that can provide this service. Here at Sunshine Toyota, we have a wide range of Toyota Genuine Accessories for all Toyota makes and models tailor-made to complement each vehicle's unique styling and performance whilst meeting all relevant regulations.